Choosing an extraordinary bathtub for your new or remodeled bathroom has its challenges, one of which is choosing an equally extraordinary tub filler to match. Though a bathtub filler has a humble job, it can perform it spectacularly and look incredible when not in use. As with any other design element, you’ll want to carefully consider both form and function as well as any installation issues you may encounter. Choosing a tub filler that complements your bathtub and the style of the room while meeting other criteria important to you is essential. Use the tips below to find the perfect tub faucet for your bathroom. You may not have given much thought to bathtub fillers up until now, but there’s a lot to learn before you start shopping. Let’s start with the basics. What Is a Tub Filler? Often called tub spouts or faucets, bathtub fillers are plumbing fixtures that deliver hot and cold water to the bathtub. They typically include knobs or a lever (diverters) for adjusting the temperature and flow of the water. Some bathtub fillers, particularly freestanding bathtub faucets, include a handheld shower wand, which is useful for rinsing off, hair washing, bathing kids and pets, or even cleaning the bathtub. Wall-mount bathtub fillers — As the name implies, these mount to a wall. Various treatments are available for the handles and spout. For example, spouts are often mounted individually with the faucets mounted above or to the sides of the spout. However, all-in-one units are available that attach to the wall with just one cutout required. Wall-mount tub fillers are typically used with bathtubs that are also attached to the wall. However, depending on the spout length, some wall-mounted bathtub fillers can be used with nearby freestanding bathtubs if installed against a wall. Deck-mount bathtub fillers — These bathtub fillers are installed on a flat deck surrounding a bathtub. Like wall-mount bathtub fillers, deck-mount fillers come in various configurations. Handles and the spout may be installed through individual holes in the deck or an all-in-one unit installed using a single hole. Both wall-mount and deck-mount bathtub fillers require some finishing to the wall or deck after installation. Floor-mount bathtub fillers — Floor-mount bathtub fillers, or freestanding tub fillers, attach to the floor. Because more of the fixture is exposed, floor-mounted tub fillers tend to be more dramatic in appearance. Since freestanding bathtubs tend to be placed away from walls and generally lack a deck, floor-mounted bathtub fillers are commonly paired with freestanding tubs. Modern bathtub fillers — Who says bathtub spouts have to look like bathtub spouts? Many modern tub faucets have been reimagined. For example, cascade waterfall spouts fill the tub with water that cascades from a broader, flatter spout. Open spouts have an opening on top where the water is exposed as it flows through the spout and into the tub. Sleek freestanding bathtub fillers from Badeloft, for example, are decidedly modern and luxurious. Industrial bathtub fillers — Exposed pipes, retro knobs, and oiled brass finishes are perfect for industrial bathroom designs. Victorian and clawfoot styles fit in nicely as well. Elegant bathtub fillers — Perhaps you want a more understated look. Simple, but elegant, bathtub fillers are readily available in a variety of finishes and configurations. Another consideration when choosing a bathtub filler for your bathtub involves whether you will install it yourself or hire a plumber or contractor to do the job. Many homeowners can successfully install new bathtub fillers on their own by following the manufacturer’s instructions or watching how-to videos. If you’re comfortable working with plumbing and minor construction projects like patching drywall, DIY bathtub filler installation is a viable option. Is there existing plumbing to tap into or will you need to bring water pipes and a drain into a new location? How much finish work will be required once the faucets and spout have been installed on the wall or bathtub deck? Do you have the skills to patch drywall or cut and lay tile? Costs of Tub Fillers: Why are they so expensive? Surprisingly, tub fillers run an entire spectrum anywhere from $300 starting to $3,000 and up on the high end. This is due to the cost of the raw material used as many fillers are commonly made from polished chrome, brushed nickel or stainless steel, all of which typically are not cheap materials. Factor in that many fillers are seen as designer items, resulting in you paying ‘designer’ price for many fillers. Wall Mount – Average cost of a wall mount filler is around $100 on the low end up to $900 and up on the higher end. Freestanding – Average cost of a freestanding filler is around $300 with $1,200 and up on the high end. Floor Mounted -Average cost of a floor mounted filler starts around $300 and can climb to $3,000 on the high end. Deck Mounted-Average cost of a deck mounted fillers run around $200 on the low end and $600 and up on the high end. 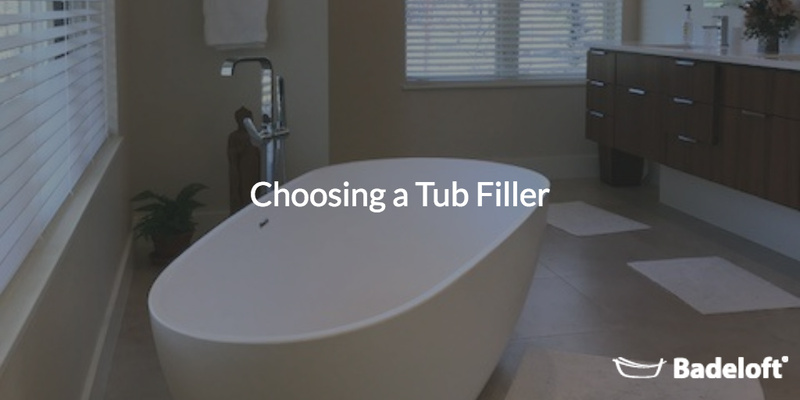 Now that you know the basics of bathtub fillers, it’s time to choose one for your bathtub. Fillers and bathtubs go hand-in-hand, so the type of bathtub you have and its location will have a large influence on the type of filler you should get. Once you narrow that down, let your creativity flow. For example, if your bathtub is installed against three walls, with no deck around it, you’re most likely going to need a wall-mounted tub filler as it wouldn’t make sense to place a freestanding tub filler along the one open side. Browse through a few design websites, magazines, or even Pinterest for style ideas, focusing on bathtubs similar to yours. Another idea is to see what types of tub fillers your bathtub’s manufacturer offers as you’ll likely find styles that suit your tub perfectly. After honing in on a particular style, you’ll also want to explore the different finishes and options available. For example, is a hand shower available? Is the filler available in alternative finishes such as rose gold or oiled bronze? Will the faucet fit your bathtub? While it may not be installed in your tub, but rather above it or alongside it, the spout needs to be sufficiently long to divert the water into it. At the same time, it shouldn’t be too long or it will interfere with bathing. For large and freestanding tubs, the number of gallons per minute can make a big difference in your comfort level. The faster the filler can fill the tub, the less likely it is that you will step into a cold bath! Buying a bathtub filler online is an excellent choice. Manufacturers often post detailed videos, 3D images, and product installation guides alongside their product descriptions, providing you with more than enough detail to fall in love with your next bathtub filler. Start your search now!